As a survivor of sexual, physical, and emotional abuse, my life’s been fertile ground for the lies of the enemy. His whisperings of deception fit perfectly into the image I’d created for myself: I wasn’t worthy of love. Why would anyone want to love someone as broken as me? 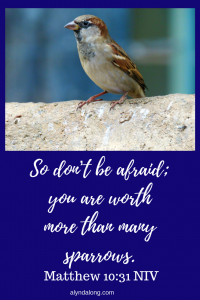 Has that tiny voice whispered “You’re unworthy” in your ear? That voice wreaked damage on my life. I didn’t trust relationships- friendships and romantic alike- because I always feared the moment the other person realized they’d wasted their time on me. The lie of unworthiness clung to me and it took decades to shed it. Has he deceived you with the same lie? How have you combated his deception? When confronted with lies, we must check them against truth, God’s word. He loves us, my friend! In the wake of my abuse, I made wrong choice after wrong choice. The decisions piled up, and I found myself buried under my sin. The enemy throve in that dark place. He whispered, “You have done too much. Too much even for God.” I believed him, so I added to the pile of sins and sank even deeper under the burdens. What felt like an indictment against myself was truly an allegation against my Lord and Savior. The enemy is tricky that way. He whispers those lies and distracts us from our real struggles. God’s word tells us nothing is unforgivable if we only confess and repent. Have the enemy’s lies convinced you of the same thing? Has he altered your view of the Lord like he did to me? Stuck in the Middle – Three Lies the Enemy Tries to Tell! Dear Donna, thank you for your vulnerability in responding. I’m so sad that your parents have caused such deep pain in you. I am encouraged by God’s reminder that He loves us regardless of how our earthly parents treat us. Praying alongside you as you allow God to demonstrate His love and forgiveness in your life! Recently, I spoke at an event and we explored the lies the enemy of our souls speaks to us. Interesting, how he points the finger at our past and instead of that label being a descriptor of a past action, sin or mistake, it becomes an identifier. We wear it as a cloak and it becomes who we believe we are. Thank you for sharing this so that together we can explore the truth of who Jesus says we are. Dawn, YES! I agree with everything you said. I am so thankful you have responded to the call the Lord is placing on your life to speak truth and love into others’ lives! The enemy is so tricky and doesn’t want us to see the truth of who Jesus says we are. Praying with you that we continue to dig into our identity in Christ and knock out the lies of the enemy! i love this blog & i believe God brought me here for a reason. I believe everything happens for a reason good & bad. We grow through these experiences & God wants to use our brokenness to shape us mold us grow us strengthen us. The enemy wants to use those past experiences to keep beating us down, reminding us of past hurts but God brings beauty out of those ashes. Dearest Annette, thank you so much for your encouraging comment. Yes, I believe He knits everything together too. He wants to use our stories and pain to help others. The enemy wants us to live in those dark places, but that is not God’s wish for our lives. Feel free to message or email me if you’d like. I’d love to pray with you as you walk along the path the Lord has for you, my sister! Tia, thank you for your transparency! Yes, he is so good at convincing us of failures that are not really ours! The Lord made YOU uniquely and exactly the way He wants you and He has a great purpose for your life, my sister. This is a much-needed message. Thank you for writing it. I definitely have lived with and believed the lies of the enemy for far too long in my life and can completely identify with some of the things you’ve said. Even having had people pray about certain words spoken over me in the past, sometimes the enemy can still bring those to the surface to continue to haunt you, especially when things turn out in such a way that seems to confirm those very words. That’s when they come back to bite you. We definitely need to tune ourselves to hearing only God’s voice and what he says about us and our situation. The thing is though, that we are actually unworthy. We all are on our own merits. We all have fallen short of the glory of God. Our own righteousness is like filthy rags. It’s only by God’s grace that we can come into his presence as Jesus has made a way for us. When we are clothed in Jesus’ righteousness, God sees us as worthy. That is the power of God’s grace to us. Robert, thank you so much for your comment, your encouragement, your transparency, and your wisdom! YES, I absolutely agree that, apart from Christ, we are incapable of achieving anything at all. John 15:5 tells us, “I am the vine; you are the branches. If you remain in me and I in you, you will bear much fruit; apart from me you can do nothing.” The Lord created us to do good works for Him and His people. If we believe the lies of the enemy then we are greatly limited in doing those works for the Lord. Praying that we each seek His wisdom and bathe ourselves in His truths daily. Blessings to you, my brother! This is something that I am struggling with! The enemies lies – thank you for shining a light on this. Susan, thank you for your comment and transparency! I believe we all struggle with this in some form until we get to the other side of eternity! Praying the Lord’s truths over your life! blessings to you! This is a great reminder! Every thought in our minds needs to be checked for the truth, because like you said, lies creep in so easily if we’re not on guard! Rebekah, thank you so much for reading and commenting! Yes, every single thought needs to be checked against the truth. I am not always vigilant in this area, but am working on it! This post reminded me of how small our understanding of God‘s love is. I think we listen to those lies because we cannot conceive of his kind of love. We do not have the capacity to love like that. And we do not see that kind of love in others around us. But his kind of love… Now that is something else. You point us toward the great depths of his love. Andrew, thank you for reading and commenting on this post. I am encouraged by your words. Yes, His kind of love is beyond our understanding. I thought I “got” it when I became a mother, but that’s still eons from the Love of Christ. Blessings to you! Great post Alyndalong. The kind of lie I’ve allowed sink into me is slightly different from yours’, as it is mostly centred on the Christian faith. I found myself doubting words in the Bible. I’d love to believe that God is always there for me. That he’ll shield me from all evil. But sometimes I wonder if he actually cares. I still pray, still goes to church(not like I used to), still, I don’t seem to be convinced God is ever present in my life. Like Rebekah said, lies creep in so easily if we’re not on guard. I know within me that I’ve lost my guard, and I’ll try all my best to regain it, and I believe your blog is one of the stepping stones. Justice, thank you so much for commenting and sharing your struggles with me. I don’t take that lightly and am adding your name to my daily prayer calendar, so I can lift you up by name each day. Oh that’s been a big one for me too! I have some book recommendations that have helped me with this struggle. Please let me know if you’d like me to share them with you. Justice, God IS always there for YOU. If you were the only person in the entire world, He still would have sent His son to die on the cross for YOU! YOU are that valuable to Him! Since we have free will in this world (and so does everyone else), evil will come. John 16:33 tells us, “I have told you these things, so that in me you may have peace. In this world you will have trouble. But take heart! I have overcome the world.”. We WILL HAVE TROUBLE. Being a believer in Christ does not completely exempt us from the struggles of the world. Yet, we have HOPE. We can find JOY even in the hard times. One of my greatest joys in my life today comes from helping others through struggles because I was redeemed from MY struggles. Joseph tells us in Genesis 50:20, “You intended to harm me, but God intended it all for good. He brought me to this position so I could save the lives of many people.” Good can come from the worst experiences. God can be glorified and His people can receive blessings. Thank you so much. I’ll very much like to read any book you recommend. Thanks ma for sharing. I’ll definitely try it out. My faith was always a heart transformation, but I didn’t understand WHY I believed what I believed, so I couldn’t defend my faith with God’s truth. Reading the Case for Christ helped me understand on an intellectual level too. Praying God’s peace over you!